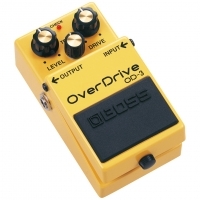 The Boss OD-3 is an analog overdrive pedal effect which many guitarists use as a boost to push their amp rather than a traditional overdrive. The main reason for that is the OD-3s impressive dynamic range. Thanks to its two stages overdrive circuit, this pedal delivers rich and powerful sound and is in fact pretty versatile. A lot of users recommend the BOSS OD-3 for the blues-rock player, we however feel it can cater to many more styles.